Atomy aims at is gaining absolute trust from consumers so that anybody and everybody can ‘Trust and Buy’ Atomy. 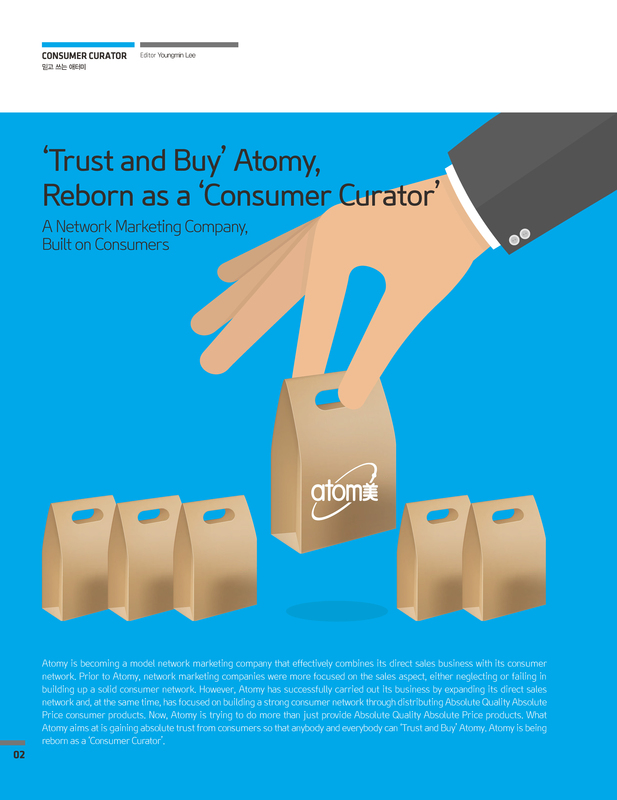 Atomy is being reborn as a ‘Consumer Curator’. Atomy considers itself to be a Consumer Curator. Art galleries and museums have curators who help analyze and interpret the pieces on exhibit for the visitors to understand and enjoy. Similarly, Atomy aims to provide a curation service that analyzes consumers' needs and suggests the best products as a curator of consumer life. We are in an age of information overload. As the saying goes, “too much is as bad as too little,” and too much to handle could even be worse than not enough. The vast amount of information that floods the internet and mobile devices confuses consumers. This excessive amount of information may actually cause an increase rather than a decrease in prepurchase expenses. For consumers, the price of the product itself is only part of the total opportunity cost they pay for the product. They also end up paying for the shipping and disposal costs. On top of that, doing the legwork to find the best deals and the mental stress of “should I buy it or not?” are all calculated into the total cost of the product, adding up to extra pre-purchase expenses for consumers. Committed to serving as a shopping curator for its members, Atomy works to reduce the final cost consumers pay for the products they buy. If Atomy succeeds in building consumers’ absolute trust in the quality and price of Atomy products, consumers will ultimately be able to buy the products whose quality and price meet their expectations even without doing the legwork or spending time and money to ‘shop around’, thereby dramatically reducing pre-purchase expenses. Meanwhile, the mental stress of “should I buy it or not?” can also be resolved if consumers can have absolute trust in the products they buy through Atomy shopping mall. This is what we call ‘Trust and Buy Atomy!’ Plus, as a shopping curator, Atomy is continuously making efforts to minimize postpurchase expenses as well. Atomy has been committed to gaining trust from consumers. Although some people may have their doubts about network marketing as a distribution channel for consumers, Atomy is considered a successful network marketing company who has laid the groundwork for trust through the motto of Absolute Quality Absolute Price. This is backed up by statistics from the Korea Fair Trade Commission (FTC). Based on the FTC business information disclosure on network marketing companies, the return rate for Atomy was only 0.12% in 2017. This is the lowest in the network marketing industry, and may even be the lowest among other distribution channels as well. To compare, the return rate of general household goods in department stores is about 3-4%. Atomy’s very low return rate implies that nearly all of its consumers are satisfied with the quality and price of the products they purchase. The growing number of registered members of Atomy is also a testament to the fact that Atomy is gaining trust from consumers. According to the FTC data, the number of registered members for Atomy was around 58,000 in December 2009. In December 2017, the total number of members was close to 3,318,000, showing a massive increase by nearly 60 times in eight years. In addition, nine out of ten registered members in 2017 were consumer-members who were not engaged in any aspect of business. They did not receive any commission or compensation. They bought Atomy products simply because they liked the quality and price of the products. The purchases from these consumer-members amounted to 80% of the total sales of the company. There is no doubt that this solid consumer network of Atomy is the basis for its steady growth as a network marketing company. Atomy is a company that not only provides good products, but also provides a good platform where consumers can simply “Trust and Buy.” Atomy members are always thinking about how to help more and more consumers buy and use the quality products offered through Atomy’s shopping curator services. Building up trust in Atomy will ultimately lead to consumers acquiring good products at a lower cost minus all the extra expenses.